Mr Stephen Volk is the mind behind such gems as Gothic, Ghostwatch, and Afterlife … please take a moment to indulge in the traditional Wayne’s World “We’re not worthy” obeisance. Done? Excellent. He’s been quite rightly described as “one of the godfathers of British horror” (Michael Wilson, This is Horror), and he’s taken some time to kindly answer some questions for me. It’s so hard to remember the chronology, isn’t it? I’m trying to think of the first book I bought from Gould’s the local newsagent’s (mentioned in my story!) and it was possibly the tie-in paperback of the Amicus film, Torture Garden, which showed a man in an electric chair. I was much too young to be allowed in to see the films, you see, so it was a way of getting a bite of forbidden fruit. In it I remember reading the Robert Bloch story “Enoch” and not being sure if Enoch was real or in the protagonist’s mind. I think that was the first psychological horror story I read: I’ve no idea if it stands up now. 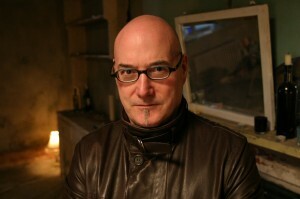 I was immensely flattered to be on the esteemed shortlist of writers asked by Mark Morris to contribute to his passion project, which I knew was something of a homage to the Pan and Fontana books of horror and ghost stories, though not meant to be in any way an imitation regarding contents. I immediately knew the idea I wanted to write for him because I’d been thinking about it for years. Being about a young boy, it had echoes of my novella ‘Whitstable’, which I know Mark was a huge fan of. But most of all it is a story I’ve wanted to tell for a long time because it is absolutely based on fact! When my brother was about eight years old he made a ‘guy fawkes’ and got extremely attached to it. My mother got scared of the thing propped up in the room, and it frightened her when she did the housework alone in the house. Andrew would sit it at the breakfast table, and as November 5th (Firework Night, as we called it) got closer he didn’t want it to be burned on the bonfire as was required by custom. The mum (a housewife) and dad (a science teacher) in the story are vaguely based on my own mum and dad, and the setting is my childhood home, the exact house in Pontypridd in every detail, down to the address – though the tragic back-story of the couple and the ultimate horror are made up, I found I couldn’t write it any other way. I’m drawn to what I’m drawn to and mostly I don’t even think whether it is defined as ‘horror’ or not. But my stories, whether for the page or for the screen, often have similar themes. I like a dimension that the supernatural or paranormal element upsets not only the external status quo but the internal life of the characters: if you keep it external it is Scooby Doo or Ringu – the character it happens to isn’t specific in any way. This is perfectly fine, and M R James does that all the time. But I like to know why this person is experiencing this event, what it means to them, how it reflects them, whether it symbolises a loss or a flaw or a wound, and how they are going to be changed. Once I had dinner with my accountant and his wife happens to be a therapist and she said out of the blue: “Your stories are always about trauma” – and I realised, they more or less all are. This one certainly is. I want violence, if the story requires it, to shock and challenge me. I don’t want it to be there for titillation or to look cool. My own preference is for a creeping horror that gets under the skin and is disturbing rather than simply just giving a cheap fright. Then again, I’ve recently written a revolting short story called “The Arse-Licker” simply because I wanted to see if I could write something deeply unpleasant yet hopefully amusing. Sometimes you just give in to that very base urge to be provocative and see how far you can push it. 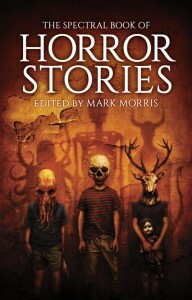 I’m reading two books that I have stories in – Best British Horror 2014 edited by Johnny Mains (Salt), and Terror Tales of Wales edited by Paul Finch (Gray Friar Press). I’m not one of these authors who put anthologies they’re in on the shelf without reading them: I want to know whose company I keep and if an editor is kind enough to pick me, who else does he like? I’m extremely proud of both the story in Terror Tales and this novella-length story for The Spectral Book of Horror Stories, both of which are set in South Wales, where I grew up. Maybe it’s a reflection of getting older, but I’m lately much more inclined to revisit the landscapes of my past – in both the geographical and the psychological sense. Horror stories often need touches of authenticity to convince, and what is more authentic than plundering one’s own life? It might feel shameful, but on the other hand, it is shameful not to. This entry was posted in News, Pimping/Promoting! and tagged Afterlife, Best British Horror 2014, Ghostwatch, gothic, M.R. James, Robert Bloch, stephen volk, Terror Tales of Wales, Whitstable. Bookmark the permalink.